Price of a typical composite Greater Vancouver home rises above the million-dollar mark for first time at $1,019,400. In July, there were 2,960 home sales in the Greater Vancouver area. Across all property types, the sales-to-active listings ratio for July 2017 is 32.2% – still a strong seller’s market, but an easing-off compared with June’s 45.5%. As of July 2017, the benchmark price for detached properties is $1,612,400. This is a slight 1.9% increase compared with July 2016 and a rise of 1.5% in the month since June 2017. The benchmark price of an attached unit such as a townhouse or rowhome is $763,700 – 11.9% higher than July 2016 and a rise of 2.4% over June. The price of a typical condo-apartment in Greater Vancouver has risen to $616,600 – an 18.5% year over year increase and a 2.7% lift in a single month. 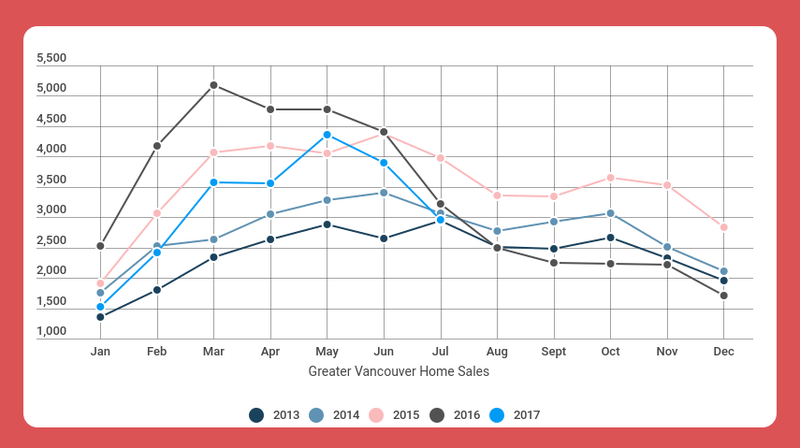 For detailed information on benchmark prices broken down by area and property type, take a look at the statistics package put out by the Real Estate Board of Greater Vancouver here. For all your real estate needs, contact Amalia Liapis at 604-618-7000 or alternatively at amalia@wesellvancouver.ca.